In Erwiderung auf Eliee Wiesels Bemerkung, der die Hams mit den Nazis verglich, haben 327 jüdische Holocaust-Überlebende und Nachfahren in der New York Times Israel des „laufenden Massakers von palästinensischen Menschen angeklagt. Letter as published in New York Times, August 23, 2014. Hunderte von Holocaust-Überlebenden und Nachkommen haben am Sonnabend in der New York Times in einem Offenen Brief „das Massaker Israels an den Pälästinensern im Gaza verurteilt und riefen zu einem kompletten Boykott von Israel auf. 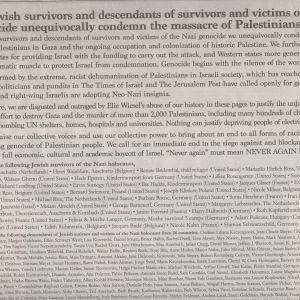 Hundreds of Holocaust survivors and descendants of survivors have signed a letter, published as an advertisement in Saturday's New York Times, condemning "the massacre of Palestinians in Gaza" and calling for a complete boycott of Israel. 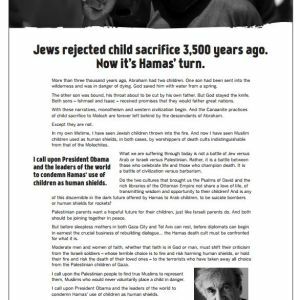 According to the letter, the condemnation was prompted by an advertisement written by Elie Wiesel and published in major news outlets worldwide, accusing Hamas of "child sacrifice" and comparing the group to the Nazis. "…we are disgusted and outraged by Elie Wiesel’s abuse of our history in these pages to justify the unjustifiable: Israel’s wholesale effort to destroy Gaza and the murder of more than 2,000 Palestinians, including many hundreds of children. 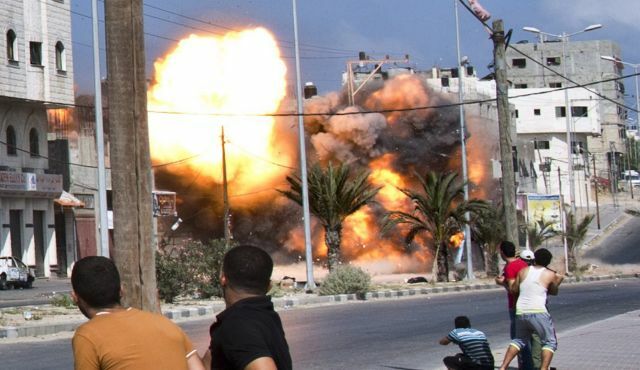 Nothing can justify bombing UN shelters, homes, hospitals and universities. Nothing can justify depriving people of electricity and water." The letter also blames the United States of aiding Israel in its Gaza operation, and the West in general of protecting Israel from condemnation. "Genocide begins with the silence of the world," the letter reads. The letter ends with a call to bring the blockade of Gaza to an immediate end, and for a full boycott of Israel. "Never again” must mean NEVER AGAIN FOR ANYONE!," the letter concludes. "As Jewish survivors and descendants of survivors and victims of the Nazi genocide we unequivocally condemn the massacre of Palestinians in Gaza and the ongoing occupation and colonization of historic Palestine. We further condemn the United States for providing Israel with the funding to carry out the attack, and Western states more generally for using their diplomatic muscle to protect Israel from condemnation. Genocide begins with the silence of the world. "We are alarmed by the extreme, racist dehumanization of Palestinians in Israeli society, which has reached a fever-pitch. In Israel, politicians and pundits in The Times of Israel and The Jerusalem Post have called openly for genocide of Palestinians and right-wing Israelis are adopting Neo-Nazi insignia. "Furthermore, we are disgusted and outraged by Elie Wiesel’s abuse of our history in these pages to justify the unjustifiable: Israel’s wholesale effort to destroy Gaza and the murder of more than 2,000 Palestinians, including many hundreds of children. Nothing can justify bombing UN shelters, homes, hospitals and universities. Nothing can justify depriving people of electricity and water. "We must raise our collective voices and use our collective power to bring about an end to all forms of racism, including the ongoing genocide of Palestinian people. We call for an immediate end to the siege against and blockade of Gaza. We call for the full economic, cultural and academic boycott of Israel. “Never again” must mean NEVER AGAIN FOR ANYONE!"